Don’t you love my charming keyboard background? My Ott-Lite is right above my computer so it’s the best spot for lighting at 12:30 in the morning. Thanks to Krystie, the Big BL stamp has become one of my absolute favourites. This is my go-to stamp for creating one-layer cards whenever I’m not using two-toned notecards. 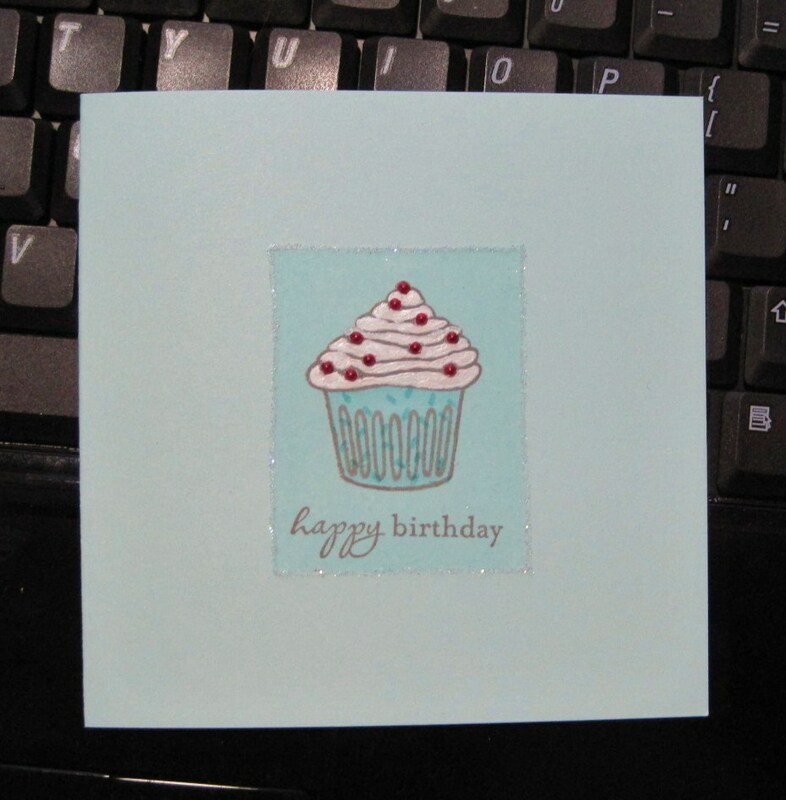 It was hidden among my Christmas stamps so I haven’t used it at all since December, but now that it’s within reach I’ll definitely be using it to make a TON more cupcake cards. I outlined the block with my Quickie Glue pen and then added glitter for a little bling. The frosting on the cupcake was coloured with my white Uni-ball pen but then I caught a glance of my new Moonlight Smooch Ink so I applied a nice frosty layer over the pen. A few cranberry pearls made sweet little candies – I would DIE for these in SILVER – I used to love those round silver candy sprinkles when I was a kid. Awwwww i love this card!!!! it’s so clean and simple!! Very pretty!!! Love the cupcake!!!! Great job!!!! WOW!! This is beautiful! I love it! Very cute, I love the frame. Love it!